A professor of history and Africana Studies in the W. E. B. Du Bois Department of Afro-American Studies since 2007, Shabazz served as the department’s seventh chair from 2007 to 2012. From 2013 to 2016, he was the Faculty Advisor to the Chancellor for Diversity and Excellence, and, since 2016, he has acted as the department's chair for an interim term. He continues to teach in the department with an emphasis on the political economy of social and cultural movements, education, and public policy. His book Advancing Democracy: African Americans and the Struggle for Access and Equity in Higher Education in Texas was the winner of the T.R. Fehrenbach Book Award and other scholarly recognitions. The Forty Acres Documents, a volume he co-edited with Imari Obadele and Johnita Scott Obadele and for which he wrote the introduction, was one of the earliest scholarly works in the modern movement for reparations for slavery and the racial oppression of people of African descent in North America. 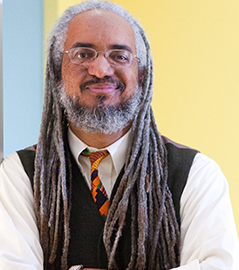 Shabazz has been a Fulbright Senior Specialist and has done work in Brazil, Ghana, Japan, Cuba, and other countries. Presently, he is completing an historical biography of lawyer-journalist-entrepreneur Carter Wesley, among other projects. Shabazz was selected for the 2014-15 class of the American Council on Education Fellows Program, the longest running leadership development program in the United States that focuses on identifying and preparing the next generation of senior leadership for the nation's universities. Born in Beaumont, Texas, Shabazz graduated from Monsignor Kelly High School, followed by his earning a bachelor’s degree in economics from The University of Texas at Austin, a masters from Lamar University, and a Ph.D. from the University of Houston, both in history. He was an associate professor of History and Director of the American Studies Program at Oklahoma State University, as well as the founding director of its Center for Africana Studies & Development. Prior to that he served as the first director of the African American Studies Program at The University of Alabama while also becoming a tenured professor of American Studies. In 2014, and again in 2016, Shabazz was elected for a two-year term as Vice President of The National Council for Black Studies, the premier organization of Black Studies professionals in the world. "The African-American Educational Legacy in Beaumont Texas," Texas Gulf Historical and Biographical Record, Vol. 50 (2014). AFROAM 236: "History of the Civil Rights Movement"
AFROAM 264: "Foundations of Black Education in the U.S."